Dear reader in previous three posts we have discussed about influence of water content and type of soil on dry density. We like to include here that methods of compaction have also great influence on dry density. With same compaction effort, different compaction method result different dry density of foundation soil. When compaction effort is constant, the dry density depends upon following actions utilized by compaction process. 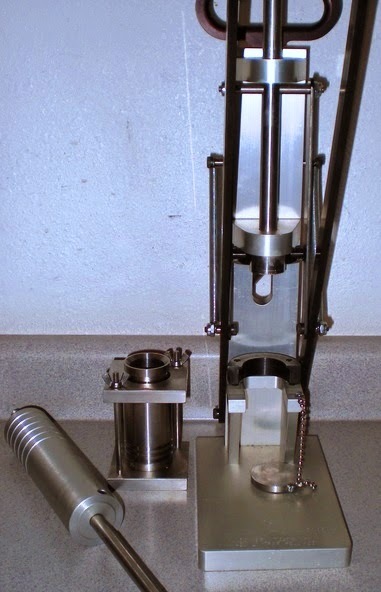 Let us take an example of Harvard Miniature compaction test. We have chosen this test as there as compaction effort kneading action is applied. In this test, 0.5” diameter tamping foot of cylindrical shape is used. The mould has capacity 1/450 ft3. The force required for tamping, Nos. of layers required for tamping for each layer depend on type of soil and required degree of compaction. In this test, compaction curve developed have different shape from the curve found in conventional tests, but compaction effort is equal in developing both curve. As conventional test we mean standard proctor test, modified proctor test etc. So compaction curve is different for different method of test and consequently lines connecting optimum will be also different. Dear reader in our next post we will learn about lines of optimum and zero void lines in compaction curve of soil.